This article is about the landmark in Coldharbour. For the rededication shrine, see Shrine to Kyne. 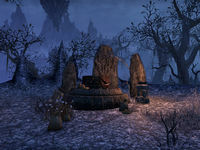 The Shrine of Kyne is located southeast of The Everfull Flagon in southeastern Coldharbour. It is an abandoned shrine to Kyne that was dragged into the Daedric Realm, and can be found at the end of a winding path. A Spider Daedra known as the Spinner of Lies patrols the area and the rare flower Kyne's Tear grows beneath the trees nearby. Special Blend: Investigate the alluring mead at a Coldharbour tavern. Coldharbour Pathfinder 5 Discover all of the striking locales in Coldharbour. This page was last modified on 30 January 2019, at 11:56.